German Chancellor Angela Merkel will miss a vote on whether to label the killings of around 1.5 million Armenians by Ottoman Turks during the First World War as genocide. The German parliament is set to weigh in on the resolution on Thursday. “At the moment, this vote is due in the morning or at lunchtime and as things stand the chancellor will not take part in the vote in the German Bundestag because she has public appointments,” spokeswoman Christiane Wirtz said on Wednesday, as cited by Reuters. Although Merkel will not be attending, the chancellor has already indicated that she is in favor of the resolution. “She told me this morning that she sided with her parliamentary group,” Wirtz said when answering a question regarding whether Merkel approved the resolution to recognize the Armenian genocide, according to AFP. Her stance is supported by Armenian President Serzh Sargsyan, who has urged German politicians not to be influenced by Turkish rhetoric. “I am sure: the politicians in the Bundestag see it the same way and will not allow themselves to be intimidated,” Sargsyan told the German tabloid Bild, Reuters reported. “If one makes compromises for short-term political interests, then one ends up doing so again and again. And that is bad for Germany, that is bad for Europe and the world,” he added. By skipping the vote, the German head of state will be extricating herself from a potentially tricky political situation, as Turkey has been putting pressure on Berlin to reject the resolution. Turkish President Recep Tayyip Erdogan has already warned that relations between the two countries will suffer if Germany recognizes the mass killings of Armenians as genocide. Former German intelligence officer Rainer Rupp told RT that the Turkish president was guilty of “gross interference,” and pressuring the German parliament would not be tolerated. “If Erdogan thinks he can deal with the German parliament the same way he deals with the Turkish parliament, he is dead wrong. In fact, even members of parliament who were cautious before, think they should not give in to Erdogan’s or Turkish pressure on this,” Rupp said. Merkel has been accused of being soft on Ankara’s human rights abuses because of her desire to stem the flow of migrants entering Europe, which a deal recently struck with Turkey is supposed to alieve. Meanwhile, in April, Merkel allowed German prosecutors to look into charges against comedian Jan Boehmermann, who had recited a satirical poem critical of Erdogan. Ottomans authorities began the mass killings in question on April 24, 1915, when 250 Armenian intellectuals were detained and later executed in their capital, Constantinople, which is present-day Istanbul. 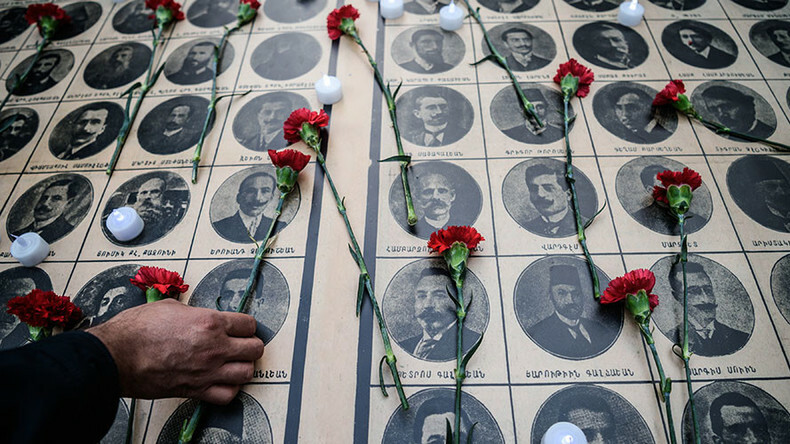 Thousands of people around the globe took to the streets earlier this year to remember the 1915 massacre. However, German journalist and historian Michael Hesemann believes that no matter what Germany decides or how Turkey reacts to it, it is Germany’s responsibility to acknowledge it as such. “Turkey will protest, but Germany should not obey to a dictator like Erdogan. Germany has a historical responsibility to acknowledge the Armenian genocide just because we were silent about it 101 years ago,” Hesemann told RT. He stressed that Germany should learn to say “no” to Turkish demands if it doesn’t want to let Erdogan boss it around in the future.